Special Jazz Concert with Nancy Harms LIVE from New York! In 2009 she released “In the Indigo”, her first CD. It was followed up by “Dreams In Apartments” (2013) and her latest recording, “Ellington At Night” came out in 2016, where it immediately became a great success. She is currently working on material for her next release. 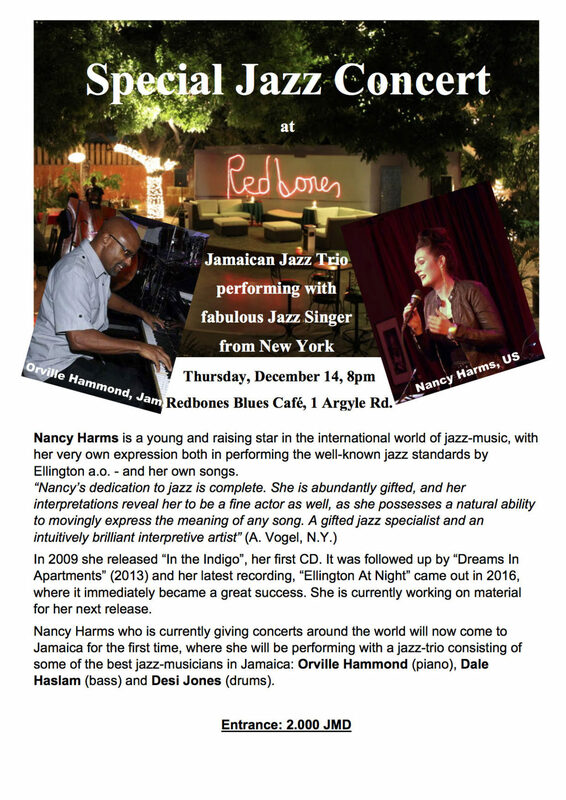 Nancy Harms who is currently giving concerts around the world will now come to Jamaica for the first time, where she will be performing with a jazz-trio consisting of some of the best jazz-musicians in Jamaica: Orville Hammond (piano), Dale Haslam (bass) and Desi Jones (drums).